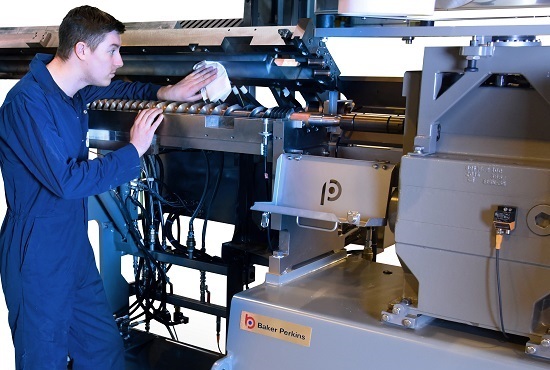 Baker Perkins introduced its new generation of MPX production-scale powder coating extruders at this year’s European Coatings Show in Nuremberg, Germany. 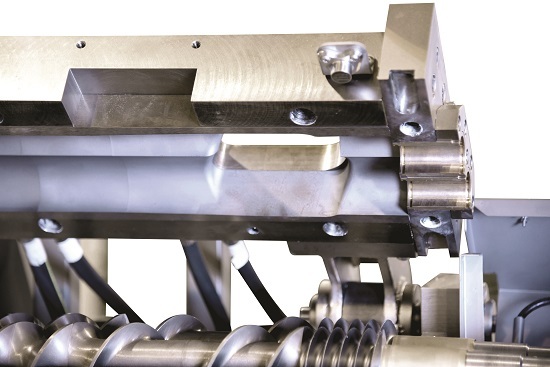 Alongside our exclusive, patent-pending MAX³ feed system, other innovative features on the extruders increase capacity, improve quality and control, reduce maintenance time and cost, improve access, and upgrade feeding. Baker Perkins’ extruders are specifically designed for all types of powder coating formulations, including epoxy, hybrids, polyester, acrylics and fines recycling. They provide continuous production at outputs from 100 to 2,900kg/hour. Tests at customers’ sites have shown that Baker Perkins’ patent-pending MAX³ feed system can lead to a throughput increase of up to 40%. A re-design of the feed port and screws improves the flow of material into the extruder barrel and air out of it, eliminating the material build up in the extruder feed port that restricts output and causes torque surges. Because of this, low density materials and fines often required a side feeder: this is no longer necessary. The surface area of the new multi-directional barrel cooling channels has been increased by 138% to increase cooling capacity, while the channels are now closer to the material being cooled to decrease response times. 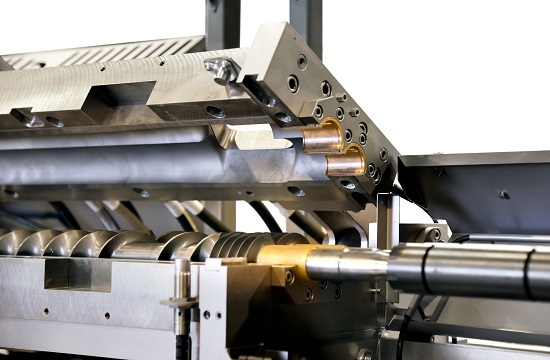 Through-shaft cooling is standard on Baker Perkins MPX 50, 65 and 80 machines. Drawing heat from the agitator shaft and the screw elements as well as the barrel minimizes the risk of pre-curing. This allows material with curing temperatures as low as 100°C to be processed reliably and enables coatings for a range of temperature-sensitive substrates, such as wood, to be produced. The top and bottom of the barrel open independently. 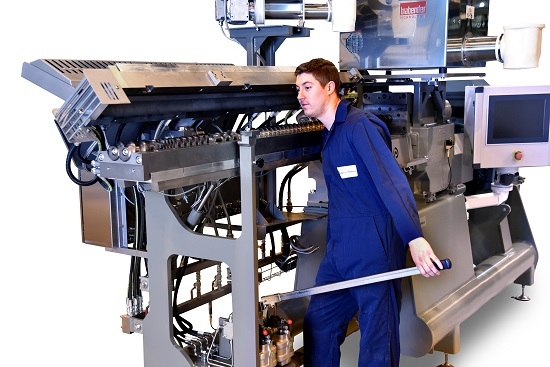 Opening only the top leaves the shafts supported so that even long, heavy shafts may be removed safely, without risk of damage or operator injury; the bottom of the barrel opens for cleaning. The stuffing box - where the shafts enter the barrel – is now split with the top and bottom halves opening with the barrel to provide instant access for maintenance. The old-fashioned gland packing has been replaced by bronze bushes that are easily lifted out when replacement is required, and the wear sleeves on the shafts are a simple push-fit that may be replaced as easily as changing an agitator element. The sleeves are now made from a harder metal and with a PVD (Physical Vapour Deposition) coating for longer life. Feeding options include a gravimetric feeder to provide improved accuracy, a pivoting mount to assist with calibration and cleaning, and a purge feeder. This provides an accurately metered and consistent flow of purge cleaning materials into the barrel which guarantees maximum effectiveness while using the minimum amount of purge material. All Baker Perkins powder coating extruders are Industry 4.0 ready. 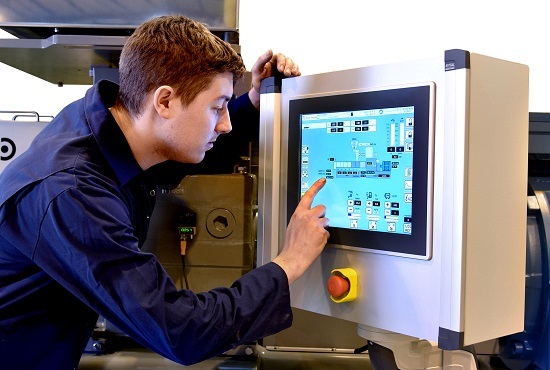 Industry 4.0 harnesses data from all the machines, devices, sensors, and people in a manufacturing operation and enables them to communicate with each other via a local network or the Internet to make informed and timely decisions. 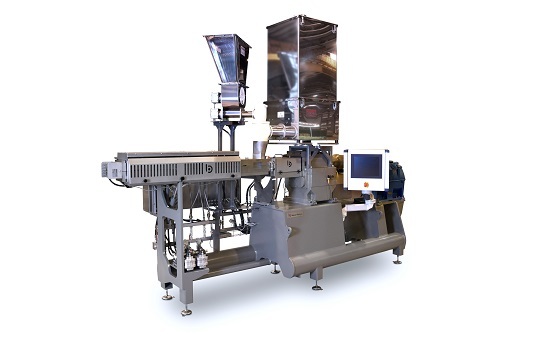 A control system with recipe set up stores up to 50 formulations and ensures exact, unvarying repeatability of every product; historical trending is also standard. Remote Internet access enables Baker Perkins engineers, with the customer’s permission, to log in to a machine anywhere in the world for fault-finding and software updates. Other features include a water cooled motor - quieter, cooler and easier to clean than the air cooled alternative. A gearbox condition monitoring system reduces unexpected downtime by providing advanced warning of maintenance needed or impending failure. Start up and shut down sequences are fully automatic, minimizing time and reducing waste.